ProForm SMART PRO 16.9 Elliptical Review | A Best Buy Review by Experts! The ProForm SMART PRO 16.9 Elliptical Trainer Is On Sale! The ProForm SMART PRO 16.9 elliptical trainer is one of their top models and offers some impressive features for not a lot of money. We especially enjoyed the 10″ full color interactive touchscreen, 20 degree incline, iFit technology, and easy out-of-the-box assembly. This latest “SMART” model comes with several nice perks. ProForm is part of Icon Fitness, which also builds NordicTrack brand machines. This is the largest manufacturer of fitness equipment on the globe. Do to economy of scale they can often offer more features for a lower price. We’ve been to the headquarters and manufacturing facilities and it is a massive operation. MID-WEEK SALE ENDS THURSDAY: The ProForm SMART Pro 16.9 Elliptical is reduced $1,599! No Interest financing available, Free Shipping, and a 30-Day Money Back Guarantee! 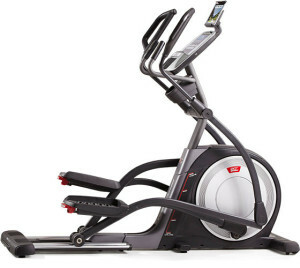 What’s to Like About the SMART PRO 16.9 Elliptical? This latest model from ProForm has several enhancements over the “non-SMART” model. To start, the console has been upgraded to optimize the iFit Coach experience. The touchscreen is faster and more responsive. Plus, this model comes with a 1-year iFit Coach membership included in the cost. 10″ Smart HD Touchscreen — The display and tablet combo is only found on Icon Fitness products. It gives you vibrant feedback on your workout stats and also iFit Coach access. For comparison, the ProForm SMART Pro 12.9 only has a 7″ Smart HD Touchscreen. 32 Lb. Flywheel — This is one of the heaviest flywheels you’ll find on a home elliptical. This provides a smooth and natural elliptical motion. Integrated Tablet Holder — This is a small and inexpensive feature but really handy! The photo of the console to the right allows you to see how the tablet holder is positioned. Create custom workouts that are aimed towards reaching your fitness goals. The workouts will get progressively harder, include audio coaching, and let you keep track of your stats online. 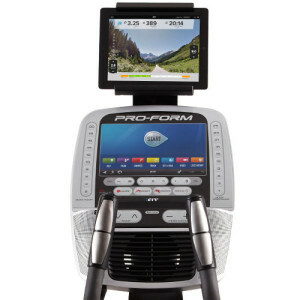 You can simulate outdoor exercise with Google Maps using the ProForm SMART PRO 16.9 elliptical. The machine will adjust incline and resistance to correspond to the actual terrain. Exercise along with video workouts that show you famous landscapes from around the world. Have you ever wondered what it’s like to workout in Paris? The main downside for this technology is that there is a subscription fee to take advantage of its benefits. 35 Installed Workout Programs — The ProForm SMART PRO 16.9 provides instant access to professional training programs. Just press “start” and you’re ready to go! Multi-Grip Handlebars — This feature allows you to adjust your grip so you can target different upper body muscles. Speakers & iPod Input — The quality of sound on many speakers is pretty awful, but we were pleasantly surprised by the quality on the ProForm machine. It’s still not the same as your home entertainment system, but it’s pretty good! Easy Assembly — Avoid hours of assembly common with other machines. The ProForm SMART PRO 16.9 is out of the box and ready to use in the matter of minutes. With other models we’ve spent literally hours assembling. Adjustable Foot Pedals — Adjustable foot pedals are great because they allow you to adjust the pedals for your body, and reduces foot lift. This also helps you avoid numb toes. Extensive Warranty — 6 years parts, 3 years labor, lifetime frame. One of the best warranties you will find for a residential elliptical trainer! ProForm SMART Pro 12.9 – This machine has a smaller 7″ Touchscreen and tablet holder for around $200 less. – Read our full review here. The ProForm SMART PRO 16.9 has a great 10″ touchscreen, 32 lb flywheel, iFit technology, and 20 degree incline. We also really liked the easy assembly! It’s a great option and has made it onto our Best Buy list. When compared to the other ProForm Pro models, this is a great choice with its 10″ Smart HD Touchscreen. the ProForm SMART Pro 12.9 has a smaller 7″ HD touchscreen, and a lower warranty for around $200 less. 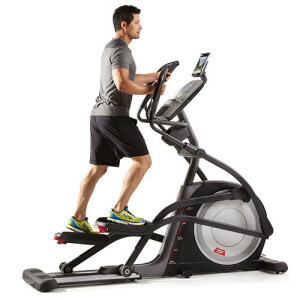 This machine will provide a rewarding workout and also motivate and entertain you. Overall, this is a nice option to consider. What is the weight capacity of this model? Thanks Brad..one more question. Is there a difference between the ProForm Pro 16.9 Elliptical and the ProForm SMART Pro 16.9 elliptical? Hi Debby, the “SMART” model is the most up to date version available. I’m not sure of the differences between the newer style versus the older model.